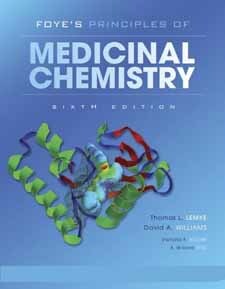 The Sixth Edition of this well-known text has been fully revised and updated to meet the changing curricula of medicinal chemistry courses. Emphasis is on patient-focused pharmaceutical care and on the pharmacist as a therapeutic consultant, rather than a chemist. A new disease state management section explains appropriate therapeutic options for asthma, chronic obstructive pulmonary disease, and men’s and women’s health problems. Also new to this edition: Clinical Significance boxes, Drug Lists at the beginning of appropriate chapters, and an eight-page color insert with detailed illustrations of drug structures. NEW TO THIS EDITION: case studies from previous editions and answers to this edition’s case studies will be available online at thePoint. New section on Disease State Management (Part IV) helps students understand how asthma, chronic obstructive pulmonary disease, and women’s and men health issues can be treated with appropriate therapeutic options. 8-page color insert contains detailed illustrations of drug structures covered within the text. Clinical Significance boxes show students how the content in each of the chapters relates to effective pharmaceutical care. Drug Lists at the beginning of appropriate chapters are bulleted lists that provide students with a summary of the drugs covered within the chapter.